1. SeaWorld Adventure Park is where the aquatic world comes alive. Experience one-of-a-kind attractions, thrilling coasters, and up-close animal interactions. 2. Discovery Cove is an all-inclusive day resort where you and your family can enjoy a one-of-a-kind opportunity to swim with dolphins, snorkel with thousands of tropical fish and rays, hand-feed exotic birds and unwind on pristine beaches. 3. Aquatica has been rated Number 1 as the Nation's Best Outdoor Waterpark by USA Today. Experience thrilling water slides, relaxing rivers, wondrous wave pools and unique animal encounters. SeaWorld creates a unique combination of aquarium and theme park. Here you'll find amazing rides, animal shows and lots of marine species to admire. Are you a roller coaster fan? 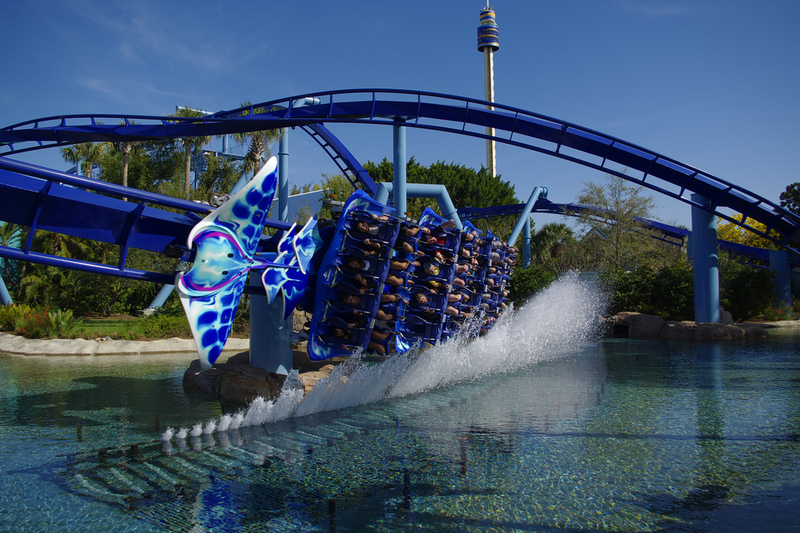 SeaWorld has Orlando's tallest, fastest and longest roller coaster: Mako. It speeds up to 73 mph and up to 200 feet high. And speaking of iconic roller coasters... Manta will let you find out what it`s like to spin, glide and skim like a giant ray. It's the only flying roller coaster of its kind in Florida and one of the smoothest tracks in the world. Wanna go to another dimension? "Kraken Unleashed" is a virtual reality coaster inspired by the most terrifying creature of mythical fisherman' stories. If you're looking for another kind of adventure, there's a wide offer of rides and shows. At the Sky Tower, you'll get a panoramic view of Orlando. This tower is an icon of the park since its opening in 1974. Don't miss the chance to elevate yourself 400 feet from the ground into its capsule. Journey to Atlantis is a beautiful ride through the dark, watery passageways of the sunken city that will soak you when it throws you down to the waters awaiting outside this city. Next to this ride, you'll find the aquarium "Jewel of the Sea" a colorful and luminescent marine world. There are perfect rides for kids: always-fun teacups, a sea carousel, a rocking tugboat, a 20-foot fall (through a quick series of short drops), flamingo pedal boats in the central lake and much more fun in the Happy Harbour area. And there are plenty of exhibitions of marine animals as well as birds such as flamingos and penguins. Watch baby dolphins at Dolphin Nursery, enjoy the fantastic shows with dolphins, sea lions, and orcas. Don't miss the amazing Shark Encounter, it offers a fascinating journey through one of the world's largest underwater viewing tunnels. Discovery Cove® in Orlando was recently awarded the TripAdvisor® Certificate of Excellence. This accolade recognizes superior service and is only given to establishments that consistently achieve outstanding traveler reviews on TripAdvisor. This park offers exciting animal encounters in a breathtaking tropical atmosphere. 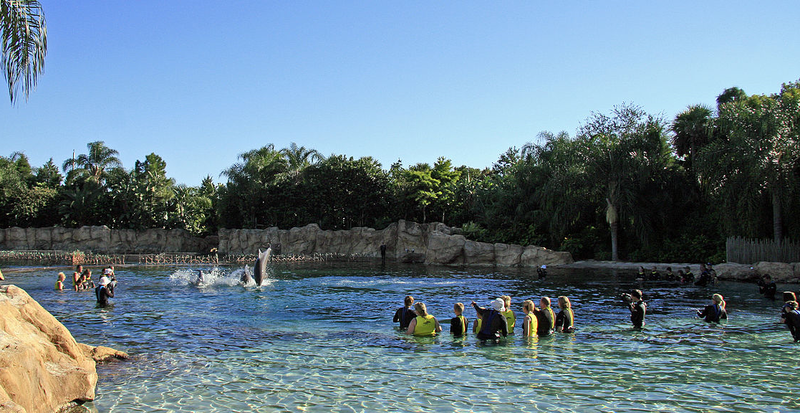 At Dolphin Lagoon you can learn about dolphin behavior and communication, and swim with bottlenose dolphins in small groups of guests accompanied by a trainer. At Explorer's Aviary, you'll watch and hand-feed hundreds of colorful birds soaring and singing around you. Relax and explore Freshwater Oasis to meet playful otters and marmosets. Don't miss the stunning habitats of the grand reef, where colorful tropical fish and velvety rays live. Visit the coral reef's island and its hidden grottos. Here you can experience SeaVenture, a unique underwater walking tour. Put your dive helmet on and enjoy every step on the reef floor. Along the way, you'll encounter schools of fish feeding around you. Moreover, you'll come eye-to-eye with sharks through an underwater panoramic window. Looking for some relaxation? You can go for a swim in a pristine pool and soak up the sun on a lounge chair in Serenity Bay. Or let yourself be taken by the tropical stream of the Wind-Away River. This experience will let you enjoy the ride through sandy beaches, an underwater cave, dense rainforest and cascading waterfalls. The ticket to the park includes unlimited access to foods and beverages, lounge chairs and hammocks throughout the resort, wetsuits and vests, animal-safe sunscreen, fresh towels and lockers for unlimited use throughout the day. Aquatica is Seaworld's waterpark that combines thrilling rides with relaxing experiences and play-areas for kids. Are you a big fan of excitement? The biggest thrill in the park is Taumata Racer, where eight people go down the waterslide on a mat, head first, competing to get first into the water. Aquatica has the steepest multi-drop watery free-fall in Orlando, Ihu's Breakaway Falls. Omaka Rocka is another ride in this park - it's a waterslide that will speed you sliding one side to another through flumes and funnels. The most popular ride of this park is Dolphin Plunge, a unique ride that can only be experienced at Aquatica. It consists of two underwater side-by-side tube slides that send you through a black and white Commerson dolphins' pool. There are plenty of rides designed for families like Tassie's Twisters (a giant bowl where you'll spin over and over again while seated in your float), Roa's Rapids (a roaring river with high tides, swirling whirlies and geysers), Walhalla Wave (ride the 6-story maze of twists, turns and tunnels on a float), Whanau Way (4 different slides to get 4 different experiences), Ray Rush (ride your raft through three amazing different slides), Cutback Cove and Big Surf Shores (2 wave pools, one with rolling action waves and another one where the surf can be high or slow and easy, your choice). If you're looking for relaxation, ride down the lazy river at Loggerhead Lane while enjoying the underwater view of exotic fish and dolphins. There are 2 play areas for kids: Walkabout Waters and Kata's Kookaburra Cove. At the cove, kids will find a beginner's body slide, water spouts and lots of fun. Walkabout Waters is a 15,000 square feet area with a 60-foot-tall fortress full of waterslides, water springs, and excitement. You can also enjoy the sandy beaches and an amazing underwater view of dolphins' pool. IMPORTANT: *We will write to your mail within 24 hours after your submission, please check your email inbox and spam folder. Thanks!